Spirit Halloween is taking its Ghostbusters license to a new level this year, following the inflatable Stay Puft Marshmallow Man costume and last year’s deluxe replica proton pack with tons of brand new officially licensed costume accessories and decorations for this Halloween, and it’s all up for pre-order now. Check out the new 2018 Ghostbusters gear from Spirit Halloween below, and click on any of the images to order yours. The following items are expected to ship by early to mid-September. Track all ghosts and other paranormal entities this Halloween when you use this officially licensed P.K.E meter! This Psychokinetic Energy Meter is the perfect accessory to finish off your Ghostbusters look! Whenever you see a ghost this Halloween, the P.K.E. meter will light up and make sounds so you can track spirits wherever they may be. You never know what kind of ghosts will be lurking around the corner! 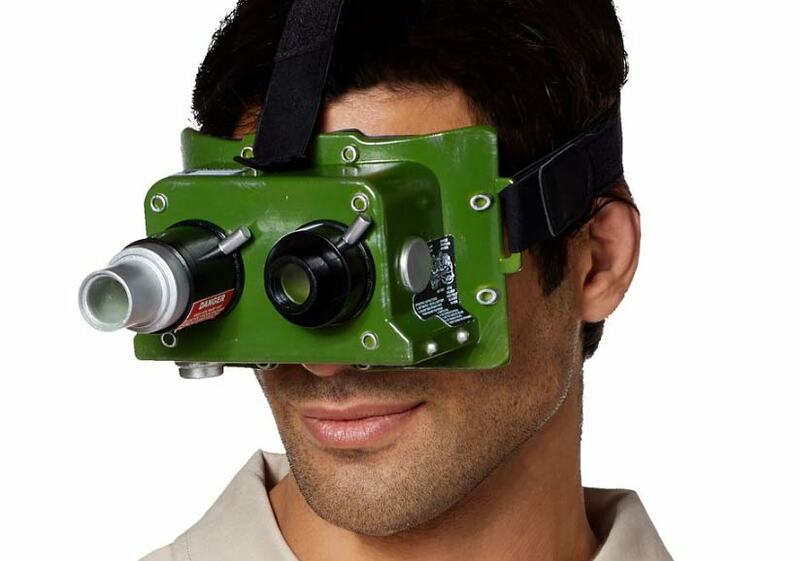 Now you can spot ghosts with ease with these officially licensed Ghostbusters ecto goggles. Just like in the film, these goggles track invisible ghosts and light up when in use. Notice something strange in your neighborhood? You know who to call–Ghostbusters! Get ready to bust some ghosts in this officially licensed Ghostbusters utility belt! Keep all of your gadgets latched onto this bad boy, and you’ll always have all of the necessary equipment to save the day within arm’s reach. With its adjustable fit, almost anyone can wear this handy utility belt! Decorate your Halloween dream scene with this officially licensed light up Slimer table turner! His green body features an internal LED light that will brighten up every dim room. Let slimer turn on any table this Halloween and everyone will be ready to start busting some ghosts! Oh, there’s definitely something strange in the neighborhood—and it’s right on your front lawn! Light up your yard with these officially licensed Slimer pathway lights and have Slimer guide your friends and family right to your front door. Whether you’re decorating for Halloween or you’re just a huge Ghostbusters fan, these fun lights are sure to make all of your guests smile! Show some love for one of your favorite film series when you hang up these awesome Ghostbuster lights! Whether you’re decorating for Halloween or you’re throwing a Ghostbusters-themed party, these fun lights are perfect for getting the party started in no time at all. They’re totally going to be calling you when you rock this officially licensed Ghostbusters jacket! You’ll look like the ultimate paranormal detective in this authentic zipper jacket. Velcro detail allows you to change your name to whichever character you want to be! Become your favorite Ghostbusters character when you top off your costume with this officially licensed Slimer mask! Ghostbustin’ has never looked so good! You’ll resemble your favorite slimey character and stay comfortable all day long. They’ll be callin’ your little one whenever there is paranormal activity! This officially licensed Ghostbusters piggyback costume is perfect for every ghost lover! This light up costume will keep your little one safe into the long night of trick-or-treating. Shop for more Ghostbusters products at Spirit Halloween here! ← Neca Unveils ‘Halloween’ 2018 Michael Myers Figure at #SDCC!